Jess and the gang: Where does the time go? It's funny how things change and you don't even notice it. 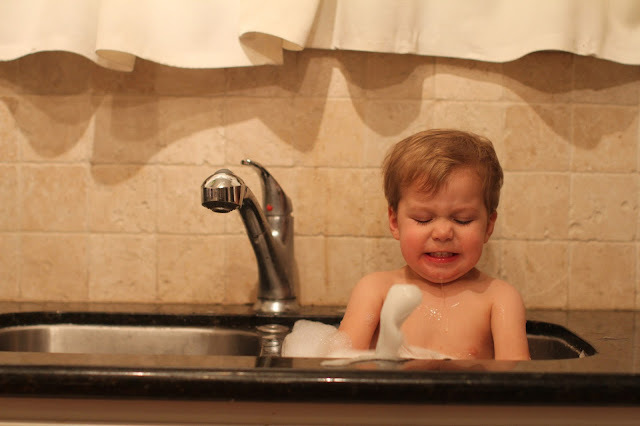 I can't tell you the last time I gave Callum a sink bath. He used to have them on the daily. Our kitchen sink practically begs for a child to be bathed in it and Callum always happily obliged. Well, obviously he has gotten older and bigger. And at some point, I guess the sink baths just stopped. The other day, while I was making dinner, Callum was under my feet constantly, making it difficult to cook, so I decided to plop him in the sink for a bath. It had been so long that at first he resisted. Well, as soon as he saw the bubbles and water flowing, there was no more resisting and he plopped right in for a grand ole time. But it caught me off guard, that whole things changing and not even realizing it. Kind of like me not remembering the last time Connor slept in our bed with us. Or not remembering the last time I just hung out with a friend I was once attached at the hip to. Things change. I guess that's just how life is. Then I read this caption on instagram, "if childhood weren't so temporary, I wonder if it would be as precious." Well isn't that the freaking truth?! I think back to my own childhood and probably idealize some of the things because they can no longer happen, so I am certain I do it with my own children's childhoods!